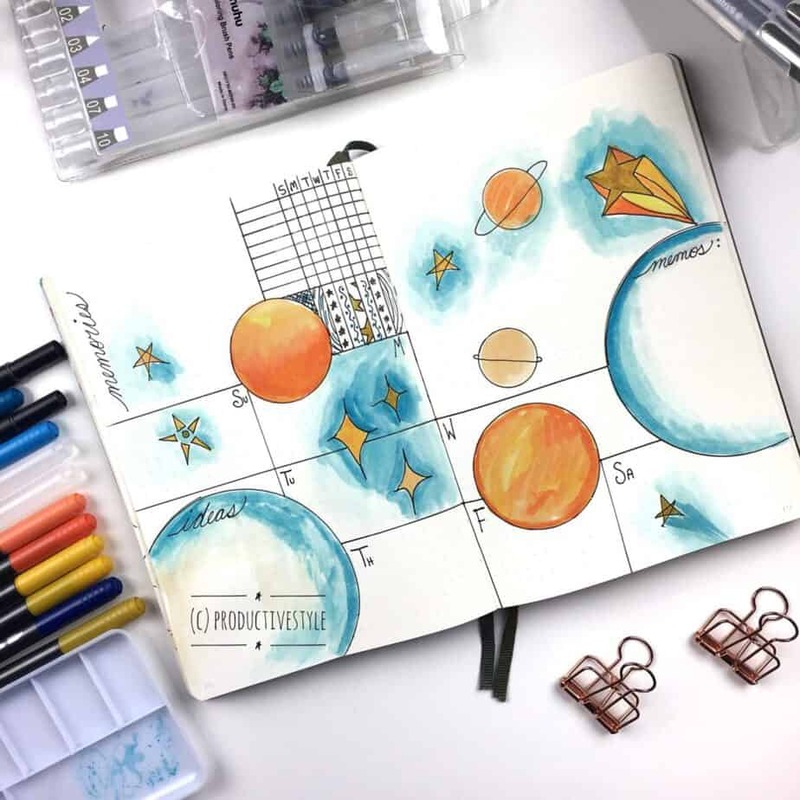 One of the most common concerns I see from the general bullet journal and DIY planning community is that setting up takes up a LOT of time. Sure, it does take back a little more time to get everything set up! However, one of the best benefits is that because you’re creating options customized to your specific needs, you actually end up saving time in the long run. I’m beyond thrilled to have my talented friend Eli from Productive Style back on the blog again, but this time, as my first ever guest post! If you don’t remember her, I featured her Christmas doodle book late last year! 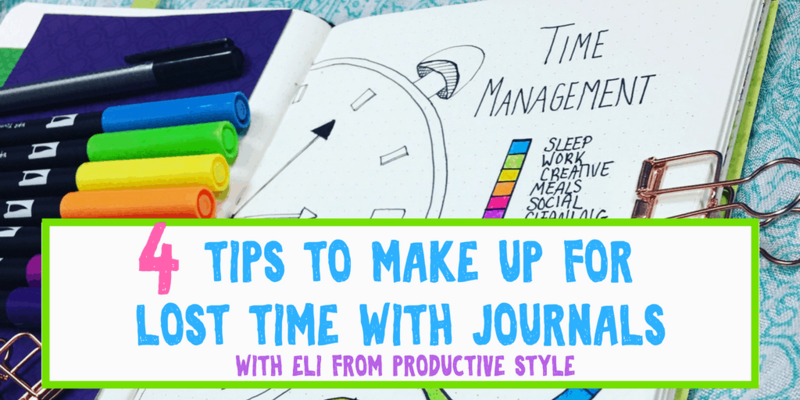 Today she’s got some great tips on how you can make up for lost time with your journal. This post contains affiliate links- I may receive credit if you purchase items from links on my blog. Check out the disclosure for more information. Thank you for supporting Planning Mindfully! Journaling and planning may seem like it takes time out of the day. After all, creating the perfect spreads and doodles can be time-consuming. Taking time out to plan tends to be one of the often-cited reasons that people quit using planners and bullet journals. Fortunately, that does not have to be the case! 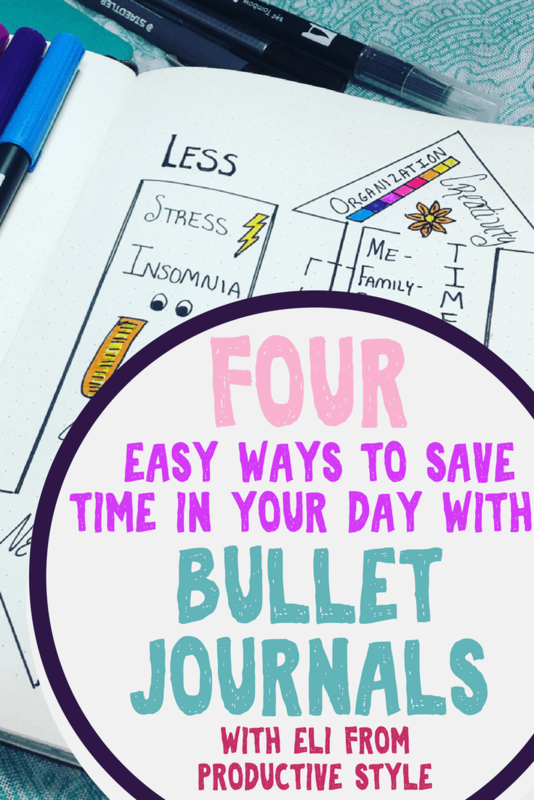 Your journal can also be a great way to add time back into your day. Here is a four-step process you can use your planner or journal to carve off more meaningful hours each week. 1. Visualize where you’re spending your time. The first step in creating more time in your day is capturing exactly how you’re currently spending time each day. 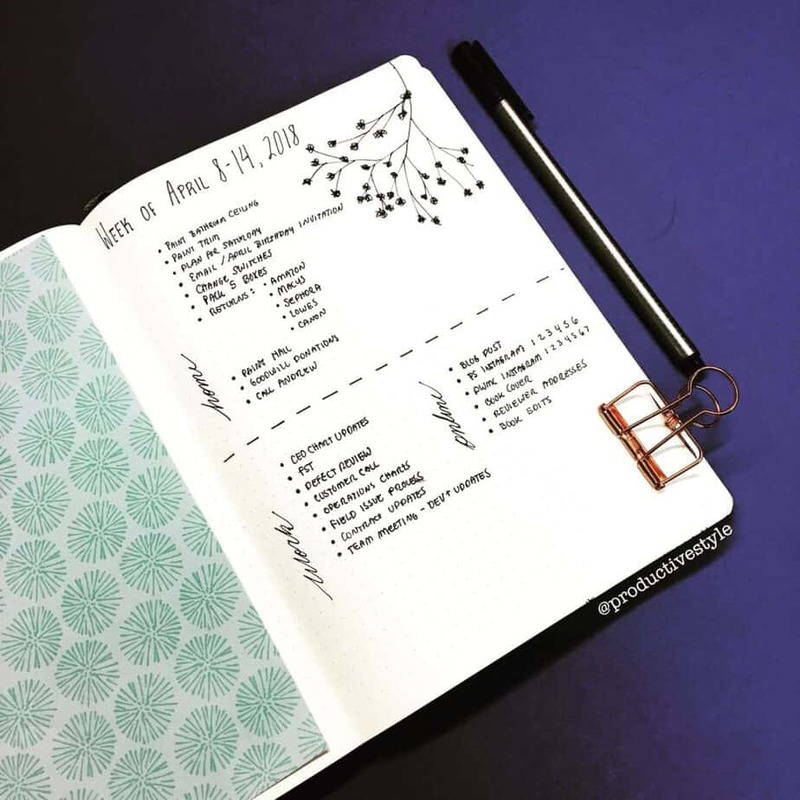 Your journal or planner is the perfect place to visualize daily activities. You can create a time ladder or time circle that shows how each hour is spent. I like to capture all of the activities I spend time on during a typical day each month. To do this, I record when I do each activity, from meal prep and planning, to my morning commute, to the time I carve off to work on new blog posts and Instagram images. While I record various activities, I use a color coding system to help me visualize where time is spent, and how time is broken up. Color coding can help you quickly see how much time you are spending on your least favorite activities and how much time you get to spend on things that rejuvenate you! Tip: Use your favorite colors to highlight productive or energy-giving activities and your least favorite colors to highlight your less-than-enjoyable tasks each day. The next step is to take some time to reflect on what you want to spend more time on, and what you’re willing to (or enthusiastic to) spend less time on. Delegating the amount of time you spend on certain tasks is an easy way to make up for lost time! While there are some less enjoyable tasks that simply must be done, reflecting on these can help you think of ways to do them that are enjoyable and effective. Perhaps you hate cleaning but love listening to music. Be sure to put on some tunes next time you have to clean! Maybe you love to read, but dread your long morning commute in traffic. Bring along an audiobook to make the mornings more fun! I love creating a page to remind me of which activities are important to spend time on, and which to leave off. A simple layout like this up and down arrow spread can create a strong visual reminder of where you should be focusing each day! Take a few minutes to review at the beginning of each week and add in activities that you’d like to spend more or less time on. Then glance each day and compare your plans to your goals. Think about those things you are doing that you’d like to do less of and brainstorm ways that you can minimize time spent on them. The more mindful you are about how you spend your time, the more likely you are to be happy and productive! Another option to make up for lost time with your planner or journal is to use time blocks. Now that you can see where your time is split, and you’ve reflected on where you want to spend time, work to create time blocks in your schedule. Time blocks are stretches of time that are set aside so you can have dedicated focus to an activity. Time blocks are great tools to help you focus. Whenever you switch between tasks, you lose a bit of time getting refocused. That time lost is a context switch. If you minimize context switches throughout the day, you’ll find that suddenly you have more time to focus on big-picture tasks and the things you most want to do! Creating time blocks can also help you re-focus energy on activities that are most important to you. It’s all too easy to focus on the most urgent tasks that pop up through your day. One unplanned urgent to-do can turn your day into a classic case of squeaky wheel-meets-broken schedule. Knowing that you’ve dedicated hours in your day to something that is important and meaningful to you, can help you appropriately prioritize those urgent tasks. I like to periodically set aside time blocks just for unplanned/urgent items. Then you can communicate back when you’ll be able to address unplanned items without losing dedicated time to focus on those important and meaningful things in your schedule. It is very hard to keep up with this, but it so important and so beneficial if you can work toward it! Now that you’ve seen how you spend your day, reflected on how you would like to spend your time, and created time blocks, the last step is to prioritize. Take a look at the items you most want to spend time on. Look at where you have carved off a time block and make sure to align those items. I like to use a simplified version of Steven Covey’s time management matrix from 7 Habits of Highly Effective People to help add context to my to-dos (If you’re looking for a great explanation of the matrix, check out this article). In the book, Covey groups tasks based on whether they are important or not important and then on whether they are urgent or not urgent. First, Covey recommends removing items that are not important and not urgent from your schedule. Then he recommends looking for ways to carve off time for items that are important, but not necessarily urgent. Tasks that are urgent and important often find a way to be accomplished. However, it’s just as critical to focus on the important, but not urgent jobs at hand. When you have prioritized all your to-dos, use the time blocks you created to plan out the best use of your day. You’ll soon find that you are calmer and collected as you go about all the items you have to and want to do! It’s Rachel again! I love how this post truly is applicable for anybody wanting to make up for lost time in their day. 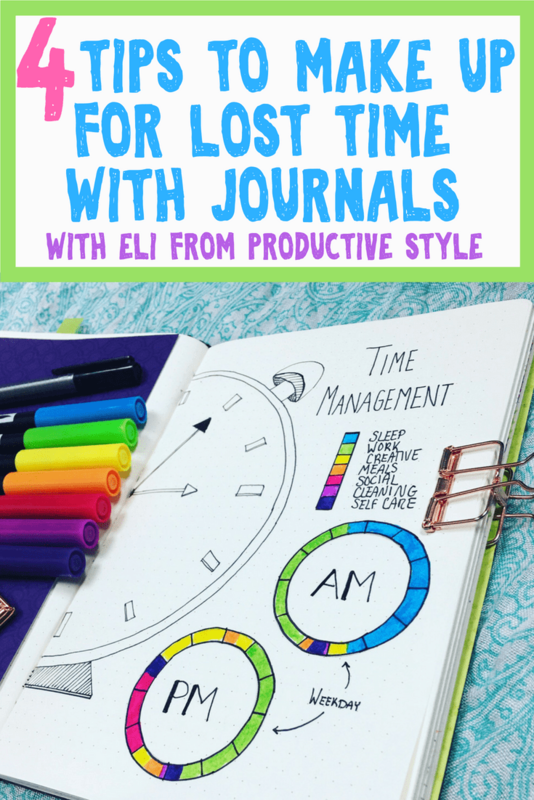 It doesn’t matter if you’re good or bad with time management; Eli’s tips are great at analyzing how you spend your time, and she provides great resources for putting new habits into place. If you consider yourself not structured, it’s never too late to make up for lost time if you’ve previously neglected tasks in the past. 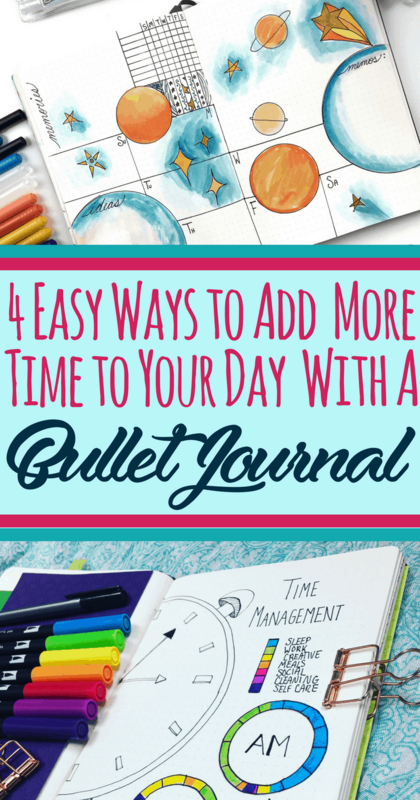 A journal is a terrific way to enhance your creativity while improving time management! If you feel like typical time management options aren’t your cup of tea, you’re in luck! There are lots of amazing time management strategies perfect for the “Type B” personality. How do you like to make up for lost time in your day? Do you see your planner as a friend or foe in time management? Leave a comment with the best time management technique you’ve found! Eli Brook is a teacher, doodler, planner, and journalist. She loves all things creative and is passionate about finding new ways to be productive. Recently, Eli has published three drawing books: Floral Planner Doodles, Christmas Planner Doodles, and Halloween Planner Doodles. You can find her at her productivity and planning blog, www.productivestyle.com, or online at a variety of places! Did you save time with this article? If so, please share on Pinterest! 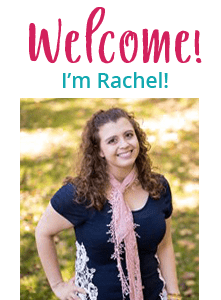 Rachel, thanks so much for sharing!! It was fun to work together on the post!